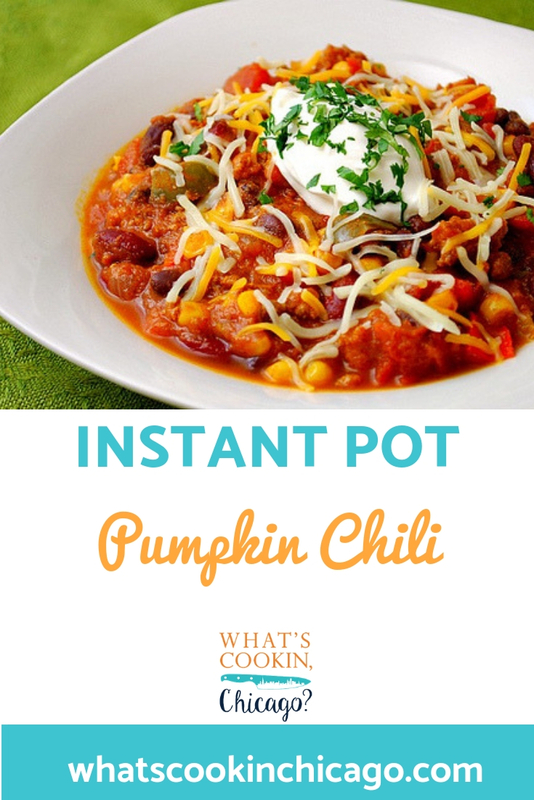 This recipe comes from Christine of Christine's Kitchen Chronicles, who was skeptical about the combination of pumpkin and ground turkey. I'll admit, I was skeptical as well but that was soon forgotten once I tried this dish. 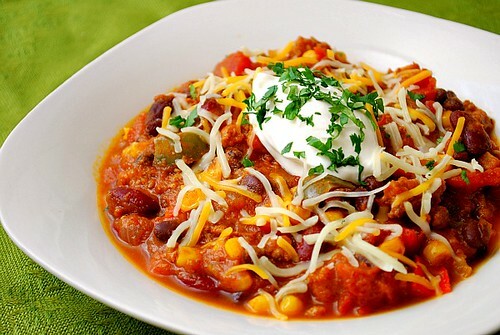 It's a chili that's perfect for fall and it's brimming with flavors, textures and colors. With the colorful bell peppers, kidney and black beans, and sweet corn all in the mix, the pumpkin lends subtle sweet notes and is delicious with ground turkey. You could also use ground chicken if you prefer. To serve, you can't forget a dollop of sour cream and a sprinkling of chopped fresh cilantro! Plug in the IP with insert set in place. Press SAUTE and add oil. When hot, saute the onion, green bell pepper, yellow bell pepper, and garlic until tender, about 10 minutes. Add ground turkey and brown, about 10 minutes. Add the tomatoes, beans, pumpkin, and corn. Season with chili powder, cumin, pepper, salt, and cayenne. Secure the lid of the IP and ensure the valve is set to SEALING. Press CHILI and adjust the time to 25 minutes on HIGH pressure. The display will reflect ON while the IP comes to pressure. Allow a few minutes for yoru IP to come to pressure. Once at pressure, the display will reflect 25 (the number of minutes you initially set) and will begin to countdown to 0 minutes. When the IP beeps after pressure cooking for 25 minutes, turn the setting on top of your IP to VENTING. Doing so allows the IP to quickly release any remaining pressure (also known as QPR or QR). I use a wooden spoon to carefully turn the setting to avoid close contact with the potential steam. You may also want to turn your IP away from cabinets to allow the released steam to escape freely. The pin at the top of your IP will drop when all pressure has been released and it's safe to open. To serve, garnish with chopped fresh cilantro, shredded cheese and sour cream, all to your tastes.